All Time Favorite Eyeshadow Palette by Zhuco Cosmetics - Review & Swatches | Sahrish Adeel - Malaysia based Pakistani Beauty & Lifestyle Blogger! When I heard that Zhucu Cosmetics is launching an eyeshadow palette, I jumped with excitement and when they offered me to swatch the palette, my excitement increased even more. The brand does not exactly have a description for the palette but has ingredients listed on the back of the palette and also the cover. I am including a photo in this post. This palette comes in a beautiful packaging. If I had shot a first impression/unboxing video, believe me, you would have seen the excitement and surprise on my face. The palette itself and the cover it comes in looks so vintage and adorable. The palette has 24 eyeshadows with a mix of matte and satin finished. I couldn't find any details about the weight of the product in the palette. Zhuco Cosmetics does not test on animals, follow FDA standards and have KKM approval. For the most eyeshadows, pigmentation is on point but break up, freedom, and 1st love have medium color pay off. These shadows pack nicely on the lids and satin ones look better if pressed with the finger. All matte shadows have a smooth texture and they are not chalky at all while all satin shades are creamy textured. These shadows apply smoothly with a brush and finger. They also blend easily and are buildable. Without a primer, these shadows last for long hours in the hot and humid weather of Malaysia but a primer or a base underneath makes the wear time even greater. For MYR 120 (about $30), the palette is great and the fact that it has a huge variety of shades along with the finishes is worth every penny. I like this palette but I would have fallen in love if breakup, freedom and 1st love were more pigmented. They look fine in swatches but the application process isn't too satisfactory for me. 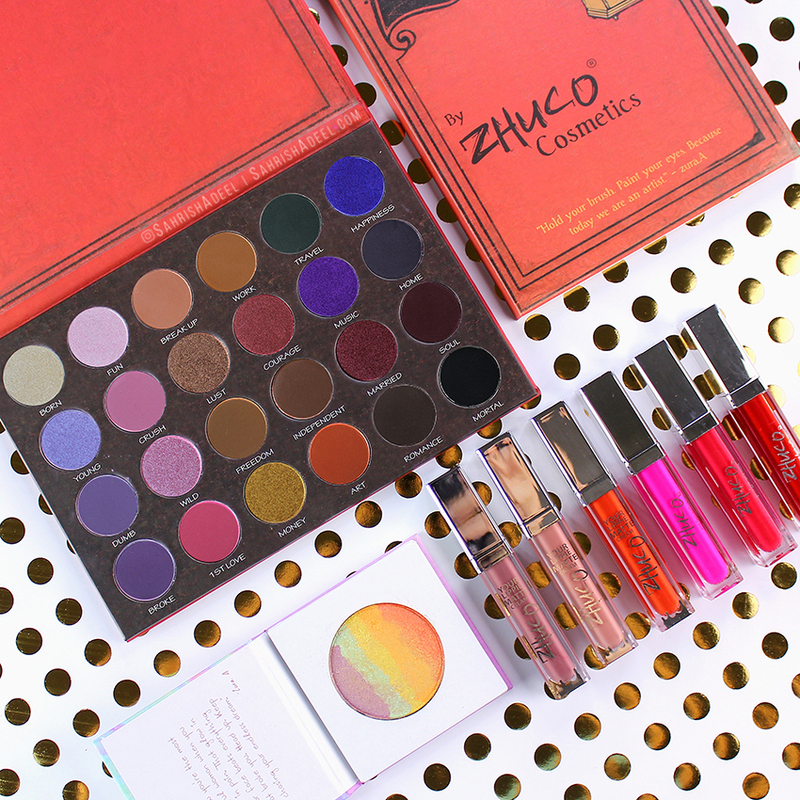 As for Zhuco Cosmetics' first eyeshadow palette ever, they did an amazing job and again, what a stunning packaging. All Time Favorite Eyeshadow Palette by Zhuco Cosmetics comes with a price tag of MYR 120 and you can check out Zhuco Cosmetics' website or their official Instagram account to place an order. They also have a huge shade range for Matte Lipsticks and a beautiful Rainbow Highlighter which I reviewed some time ago, you can check out the reviews and swatches for matte lipsticks here and for rainbow highlighter here. Do you hoard eyeshadow palettes like I do? What do you think of this palette by Zhuco Cosmetics?